Smart–designed by the watch maker Swatch and built by Mercedes–is ideal for maneuvering (either driving or parking) in large cities. Smart comes in many models. The “Passion” you see here is designed for the style-conscious driver. It offers air conditioning, automatic gearbox (no clutch pedal), and a tridion safety cell. This vehicle is at home both in the city and on the open road. The car was designed to be fuel efficient–averaging 60 mpg. While it is small, it is also safe. It has the same safety standards as other cars–airbags, reinforced steel safety cell, crashboxes in the front and rear, and steel reinforced seat backs. The high seating position moves the occupants away from the danger zone in a side impact. The small trunk space can be expanded by folding the passenger seat flat. 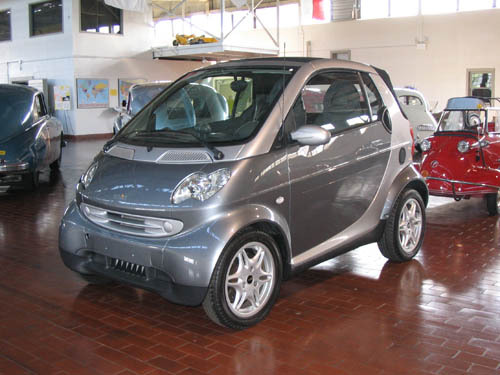 The smart is roughly 7 feet smaller than most small cars!